His name is Spirit. He is the Grandfather horse of my herd, 25 years old. Free? I think in some ways we are all about as free as we want to be. He has always been that for me: Free by choice and attached the same way. I don’t post full body shots of Spirit anymore. His back has a deep sway, his legs are bowed, and his hip bones are no longer hidden in muscle. His body no longer reflects his heart, but his eye is still free. ← Cheer up! It’s all your fault. Yup, I know how he feels! 😉 He’s still beautiful and wise. 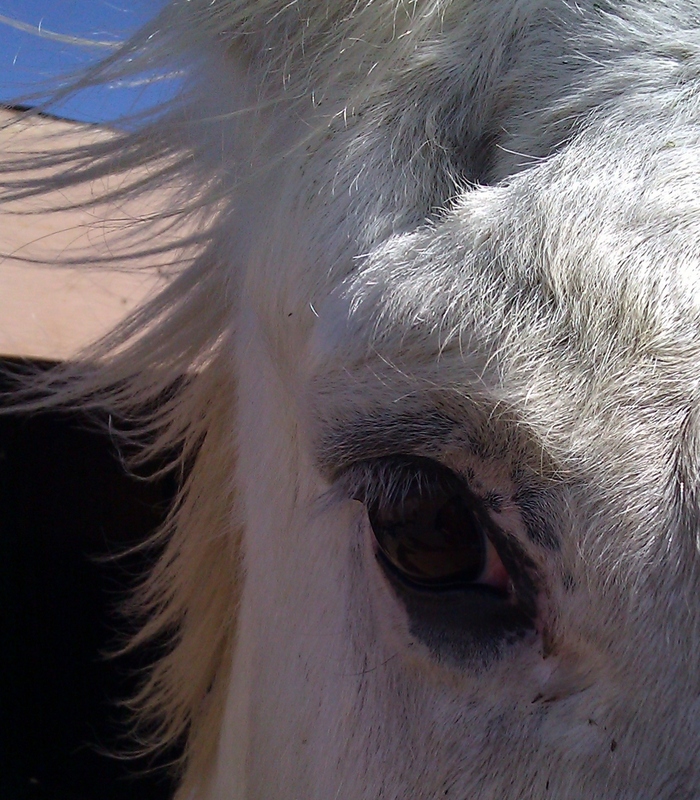 I am an old gray mare myself. I hate to admit this, but seeing a once-beautiful creature (even a human!) bow to age always taps a deep well of emotions. My gorgeous old Aly looks wretched after a hot, airless summer, though his eye is still bright, like your lovely Spirit’s, and I’m sure I can put condition back on him as the weather cools, but every time his health falters it’s such a worry and a wrench. It is definitely a day to day process with these oldsters… nutritionally and emotionally. Good luck to you and Aly this winter. I always see him as beautiful! Thank you, but I can take no credit. This horse is a gift.